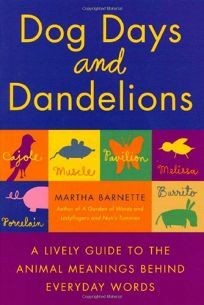 ""Animals lurk everywhere in our language,"" declares Barnette, the author of two previous books for word lovers, A Garden of Words and Ladyfingers and Nun's Tummies. From origins that are immediately apparent (grubby refers to grubs, and lousy to lice), to others that might take a little thought (burrito means little donkey, vermicelli translates as little worms), all the way to influences only an etymologist would know (bombastic comes from the Old French bombace, meaning soft padding, which in turn came from bombyx, the ancient Greek word for silkworm), Barnette offers a sprightly compendium of the animal kingdom's impact on the king's English. ""There's a little snake coiled inside the word rankle,"" ""a 'porker' in porcelain"" and ""a pair of oxen trudging round and round, grinding grain for all eternity"" in halo, she writes, and, unsurprisingly, ""an oversize insect skittering about inside the word lobster."" Arranged alphabetically, the 300-plus entries make for good browsing, and readers with a penchant for odd and underused words, such as myrmidon (an unprincipled lackey) and musteline (resembling a weasel) will find them aplenty here.